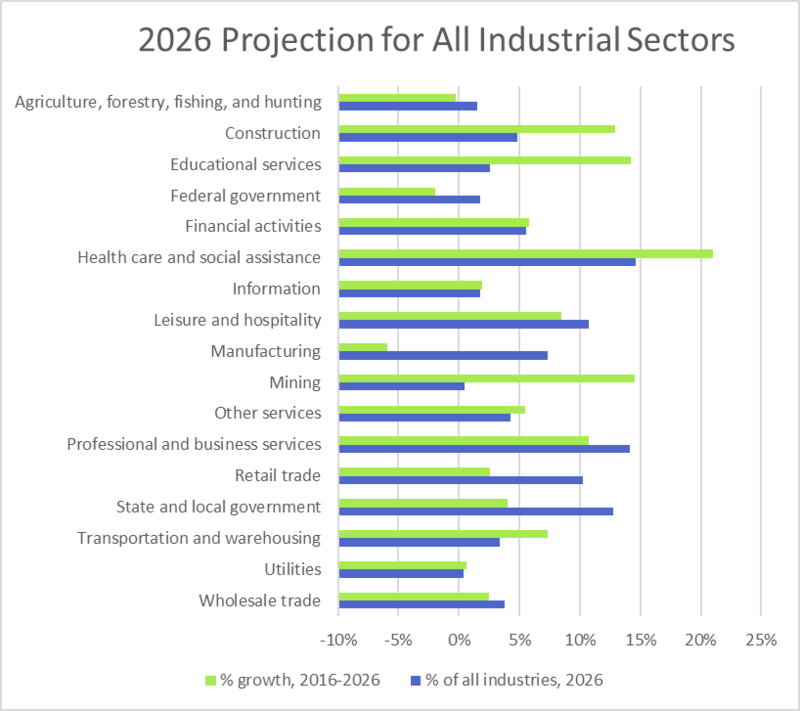 The Bureau of Labor Statistics indicates that the Health Care and Social Assistance sector will grow substantially over the next several years and will employ more people in 2026 than any other sector. 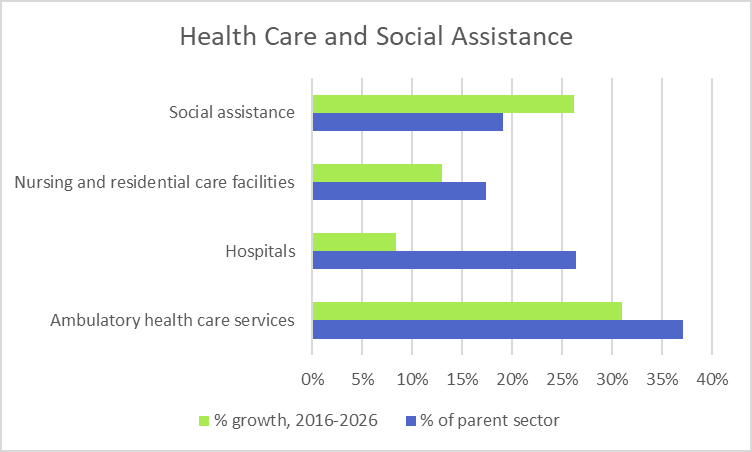 Within the Health Care and Social Assistance sector, the Ambulatory Health Care Services is the largest industry with the most projected growth. The following lists the largest and fastest growing occupations in the Ambulatory Health Care Services industry for 2026. Registered nurses are one of the largest occupations in the Ambulatory Health Care Services industry. The following indicates the projected size and growth for registered nurses. The following shows the states with the highest concentration of jobs, relative to the nation as a whole, for registered nurses. The following shows the metropolitan areas with the highest concentration of jobs, relative to the nation as a whole, for registered nurses. Home health aides are projected to be one of the largest and fastest growing occupations in the Ambulatory Health Care Services industry. The following indicates the projected size and growth for home health aides. The following shows the states with the highest concentration of jobs, relative to the nation as a whole, for home health aides. The following shows the metropolitan areas with the highest concentration of jobs, relative to the nation as a whole, for home health aides. Medical assistants are projected to be one of the largest occupations in the Ambulatory Health Care Services industry. The following indicates the projected size and growth for medical assistants. The following shows the states with the highest concentration of jobs, relative to the nation as a whole, for medical assistants. The following shows the metropolitan areas with the highest concentration of jobs, relative to the nation as a whole, for medical assistants. Personal care aides are projected to be one of the largest and fastest growing occupations in the Ambulatory Health Care Services industry. The following indicates the projected size and growth for personal care aides. The following shows the states with the highest concentration of jobs, relative to the nation as a whole, for personal care aides. The following shows the metropolitan areas with the highest concentration of jobs, relative to the nation as a whole, for personal care aides. Medical secretaries are projected to be one of the largest occupations in the Ambulatory Health Care Services industry. The following indicates the projected size and growth for medical secretaries. The following shows the states with the highest concentration of jobs, relative to the nation as a whole, for medical secretaries. The following shows the metropolitan areas with the highest concentration of jobs, relative to the nation as a whole, for medical secretaries. Dental assistants are projected to be one of the largest occupations in the Ambulatory Health Care Services industry. The following indicates the projected size and growth for dental assistants. The following shows the states with the highest concentration of jobs, relative to the nation as a whole, for dental assistants. The following shows the metropolitan areas with the highest concentration of jobs, relative to the nation as a whole, for dental assistants. Licensed practical and licensed vocational nurses are projected to be one of the largest occupations in the Ambulatory Health Care Services industry. The following indicates the projected size and growth for licensed practical and licensed vocational nurses. The following shows the states with the highest concentration of jobs, relative to the nation as a whole, for licensed practical and licensed vocational nurses. The following shows the metropolitan areas with the highest concentration of jobs, relative to the nation as a whole, for licensed practical and licensed vocational nurses. Dental hygienists are projected to be one of the largest occupations in the Ambulatory Health Care Services industry. The following indicates the projected size and growth, dental hygienists. The following shows the states with the highest concentration of jobs, relative to the nation as a whole, for dental hygienists. The following shows the metropolitan areas with the highest concentration of jobs, relative to the nation as a whole, for dental hygienists. Health specialties teachers, postsecondary is projected to be one of the fastest growing occupations in the Ambulatory Health Care Services industry. The following indicates the projected size and growth for health specialties teachers, postsecondary. The following shows the states with the highest concentration of jobs, relative to the nation as a whole, for health specialties teachers, postsecondary. The following shows the metropolitan areas with the highest concentration of jobs, relative to the nation as a whole, for health specialties teachers, postsecondary. Massage therapists is projected to be one of the fastest growing occupations in the Ambulatory Health Care Services industry. The following indicates the projected size and growth for massage therapists. The following shows the states with the highest concentration of jobs, relative to the nation as a whole, for massage therapists. The following shows the metropolitan areas with the highest concentration of jobs, relative to the nation as a whole, for massage therapists. Medical and health services managers is projected to be one of the fastest growing occupations in the Ambulatory Health Care Services industry. The following indicates the projected size and growth for medical and health services managers. The following shows the states with the highest concentration of jobs, relative to the nation as a whole, for medical and health services managers. The following shows the metropolitan areas with the highest concentration of jobs, relative to the nation as a whole, for medical and health services managers. Nurse practitioners is projected to be one of the fastest growing occupations in the Ambulatory Health Care Services industry. The following indicates the projected size and growth for nurse practitioners. The following shows the states with the highest concentration of jobs, relative to the nation as a whole, for nurse practitioners. The following shows the metropolitan areas with the highest concentration of jobs, relative to the nation as a whole, for nurse practitioners. This entry was posted in Careers, Industries and tagged Dental assistants, Dental hygienists, Health specialties teachers postsecondary, Home health aids, Licensed practical and licensed vocational nurses, Massage therapists, Medical and health services managers, Medical secretaries, Nurse practitioners, Personal care aides, Registered nurses.